Joan Myers’s book, Wondrous Cold: An Antarctic Journey, was published by Smithsonian Books to wide acclaim, and the images were featured in an exhibition at the Smithsonian Institution in 2006. 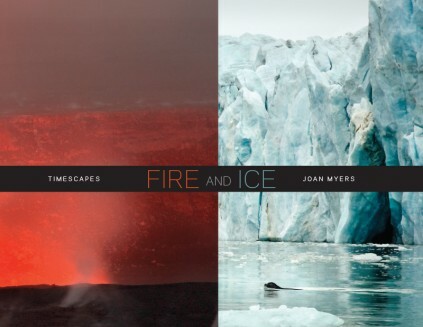 In FIRE AND ICE she adds volcanoes to the mix, with photographs of iconic sites from all over the world, including Volcano National Park on the island of Hawai’i, Lanzarote, in the Canary Islands, Cotopaxi and Picincha in Ecuador, Nevada del Ruiz in Colombia, Mt. Erebus in Antarctica, Krakatoa in Indonesia, and of course Mt. Etna and Pompeii. The work is breathtakingly beautiful, compelling, and provocative by turns. Her essay reads like an adventure story, exploring the connection between fire and ice while describing her thrilling treks to ends of the Earth. “We like to imagine Earth as a ball, a brightly-colored dime-store globe with countries and oceans drawn on its glossy surface. We forget that its surface slides, subducts, and transforms, setting off earthquakes and volcanic eruptions. Icy poles melt and then reform over geologic time, dramatically changing sea level. Fire and ice are animating forces for our planet, constantly changing its surface and atmosphere. . . . A stable earth, whatever we would like to think, is an illusion. Joan Myers has been taking photographs for more than thirty years, exploring the relationships between people and the land. Her highly acclaimed work has been the focus of three Smithsonian exhibitions, more than fifty solo and eighty group shows, and seven books. Her work is included in the permanent collections of the Amon Carter Museum, Bibliothèque Nationale de Paris, Center for Creative Photography, Denver Art Museum, George Eastman House International Museum of Photography, High Museum of Art, Minneapolis Museum of Art, Museum of Fine Arts, Houston, Museum of Modern Art, Nevada Museum of Art, and San Francisco Museum of Modern Art, among others. She lives outside Santa Fe, New Mexico. www.joanmyers.com. Kathleen Stewart Howe, PhD has curated over 100 exhibitions and been the author of several catalogues focused on the interplay of photography and culture. Since 2004 she has been the Sarah Rempel and Herbert S. Rempel ‘23 Director of the Pomona College Museum of Art and professor of Art History at Pomona College in Pomona, California. Her exhibitions at PCMA have featured artists John Divola, Edgar Heap of Birds, David Michalek, James Turrell, Frederick Hammersley, Kara Walker, and Enrique Chagoya. Her books include Excursions Along the Nile: The Photographic Discovery of Ancient Egypt (Santa Barbara Museum of Art 1994), which won a Krazna Kraus Foundation Award; and Felix Teynard: Calotypes of Egypt, (Hans P. Kraus, 1992) which was named a New York Times Notable Book in Photography in 1992. Travel + Leisure, click here to read.